Microservices is an architectural style in which large, complex software applications are composed of one or more smaller services. Each of these microservices focuses on completing one task that represents a small business capability. These microservices can be developed in any programming language. 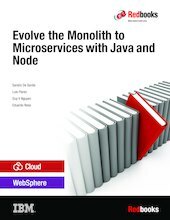 This IBM® Redbooks® publication shows how to break out a traditional Java EE application into separate microservices and provides a set of code projects that illustrate the various steps along the way. These code projects use the IBM WebSphere® Application Server Liberty, IBM API Connect™, IBM Bluemix®, and other Open Source Frameworks in the microservices ecosystem. The sample projects highlight the evolution of monoliths to microservices with Java and Node.